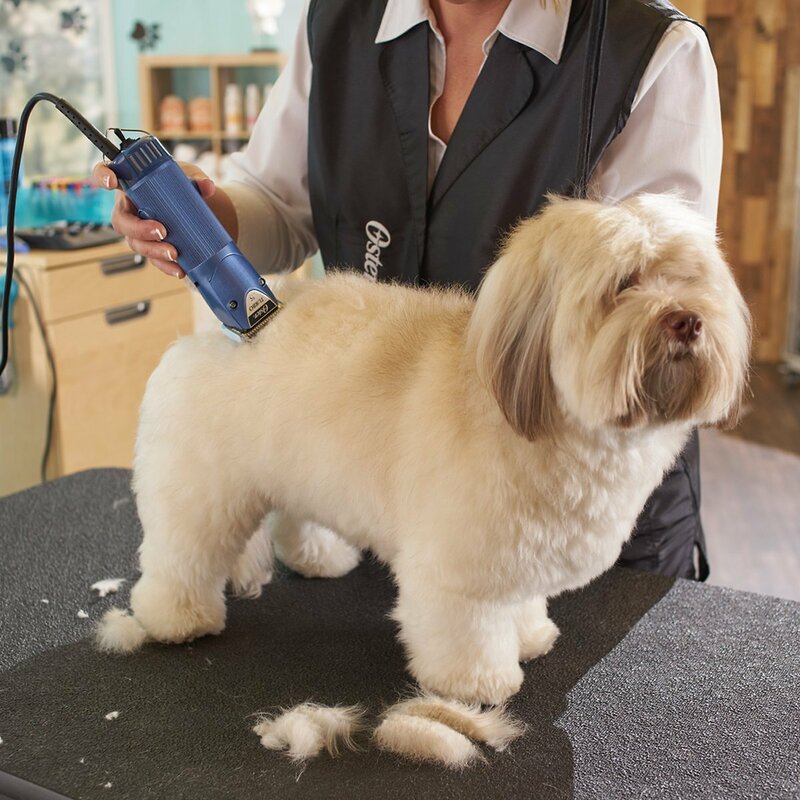 This Pet clipper is a heavy duty professional corded animal clipper. 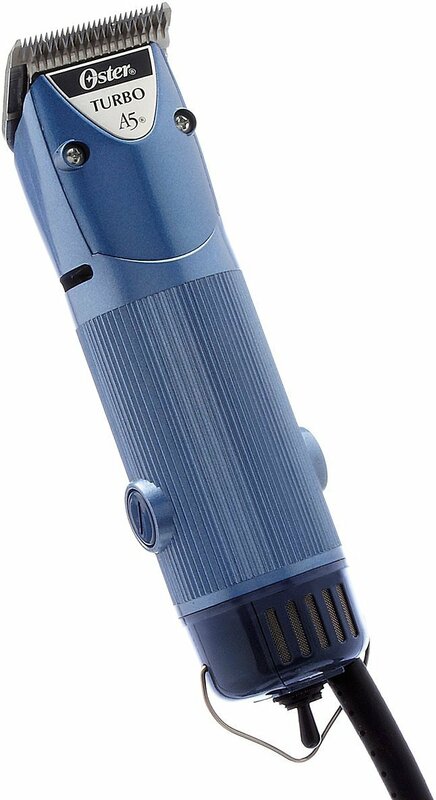 This Clipper has a powerful universal rotary motor with 2 speeds. The first setting has 3,000 strokes per minute and the second has 4,000 strokes per minute. Compatible with all Oster CryogenX detachable blades. Virtually unbreakable, durable and resilient to clip, these clippers glide through thick, coarse hair easily. Its detachable blade system provides incredible versatility as well. Compatible with all Oster® A5® detachable blades and includes a #10 CryogenX Detachable blade. Limited edition designs take trims from ordinary to a little on the wild side! (1) #10 CryogenX detachable blade. Pull the skin tight, creating a flat surface for smooth strokes. Never clip into a fold of skin. Proper care and maintenance of clippers and blades is important. Clean, disinfect and lubricate blades and perform clipper upkeep regularly for smooth, lasting performance. 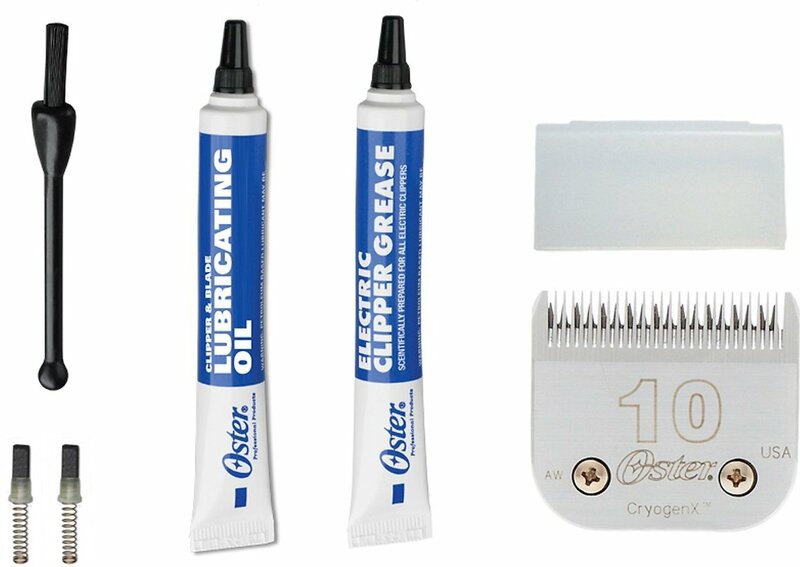 Use Oster Professional maintenance products for to keep your clipper running like new. Only clippers with a universal motor require greasing - for example, the Classic 76, Model 10 or Turbo 111. In order to grease the clipper, remove the front cover plate (nameplate) to access to the gear box. This will allow you to determine if the clipper needs to be greased. If clipper does need grease, use about 1/2 teaspoon. Fill the gear box with the grease. Make sure the grease covers the gears. Most of our products come packed with a grease tube. With the clipper facing you, place the pad of your thumb on the blade and swiftly push the top of the blade away from the clipper. This will make the blade '"tongue" or "blade assembly" open and you can slide the blade off. off the "tongue" and replace the new blade on the "tongue". With the "tongue" open, turn clipper on and then push the blade towards the clipper (shut), this will ensure the proper engagement of the blade on the driving tip. First, ensure that the rectangular metal "tongue" or blade hinge assembly is in standing position or open. If it is closed, insert a flat head screwdriver under the tongue and applying enough force, push the hinge back to standing position. Once this is complete, slide the blade on the tongue, turn your clipper on and push the blade down and snap the hinge assembly closed. Purchased these after my other Oster clippers went Ka-put!! Read on many brands wanted to stick with same brand due to all the blades I have! Anyway, it cut beautifully but boy did it heat up & fast!! I have 4 fur babies to trim & after #1 I had to wait for them to cool down! They are heavier then I thought they’d be & not contoured to fit your hand very well. So I’m undecided on keeping them or what!!?? We have bout 100s of dollars worth of clippers . And these work so darn good on our labordoodle . I won't be buying another set again for along time . They did get warm but they will do that . Love the 2 speeds and the durability they have . I had an older Oster A5 but I’d thought I’d try another brand after 15 years of use. My older one had stopped functioning. This new OsterA5 was superb. It cut through both of my schnauzers coat. Easiest trim I gave to them. The only issue is that it did get hot after 20 minutes. I just sprayed a cooling blade Spartans back to trimming I went. Such a clean trim. My schnauzers look awesome. Very happy with this clipper. It cuts through the hair like a knife through warm butter. However; it is not ergonomically designed - hard to hold if you have small hands. It is also very heavy. Must by attachments separate. Best I ever bought so far. I have 6 Standard Poodles and have gone through several clippers from several diferent brands. The Oster A5 terbo is the best I have used so far. They have a good balance in my hand and low vibration stay cool longer when in use. This was a good buy. Bought for my daughter who swiped mine to groom her Goats. Well got her her very own for her Birthday. She was surprised she got them. I have a goldendoodle with VERY thick fur! These made her cut quick and easy. I've used Oster A5 Clippers for decades. When mine died finally I decided to upgrade. Great Price and loved the color! Lighter than the old ones but the blades just never seemed to sit flat and made a lot of noise. They also get incredibly hot quick. I typically do under 30lbs dogs, easy trims and shave downs, nothing fancy in my dog/cat Rescue. I do hope I can return these. Will need to purchase another pair either A5 or others.